Thailand is often visited by foreign nationals mainly for tourism and business. Those who come to Thailand for a short holiday vacation leave the country with a silent promise to return soon either to retire, start a business or, pursue a love interest. There have been thousands of love stories between a foreign national and a Thai national that end up in marriage. Some of the marriages work and some are eventually dissolved by divorce. In any eventuality, it is important that the best legal services in Thailand handle the marriage or divorce proceedings. An affidavit must be completed and notarized at the embassy or consular office of the foreign national. The affidavit must be translated in Thai language. One would need an accredited translator in the city or area where marriage is to take place. The affidavit and translation must be submitted to the Legalization Division, Department of Consular Affairs, Ministry of Foreign Affairs office in Bangkok. The affidavit and supporting documents should be brought to the local Amphur where marriage is to be registered. The married couple should personally appear at the Amphur bringing with them the foreigner’s passport, the Thai’s ID card. If either of the parties is under age 20, a written consent from parents translated in Thai language must be submitted. If any of the parties have been previously married, the Amphur will require proof that the marriage has been dissolved or terminated. Divorce or death certificates may be presented. All documents should be translated in the local Thai language. A legally registered marriage in Thailand pursuant to Thai law is normally recognized throughout the world, although certain countries have specific requirements on validity and legality of marriage held overseas. The foreigner and the Thai national should inquire about this before getting married. It is normal that prenuptial agreements are prepared before the marriage. This practice is allowed in Thailand as long as the procedural requirements are satisfied and complied with. Both the foreigner and the Thai national can engage the services of any of the law firms providing legal services in Thailand to prepare this legal document. The local law firm can also help supervise the marriage from procurement of official documents, to proper translation and submission to the appropriate government office that would make the process legal and binding. The fact that the local law firm is familiar with all the rules, laws and requirements, the procedures can be dealt with in a timely manner. It’s always an advantage if someone who has local knowledge will assist a foreigner in a legal process like marriage since there are legal documents that have to be reviewed to make sure both parties are protected by the law. 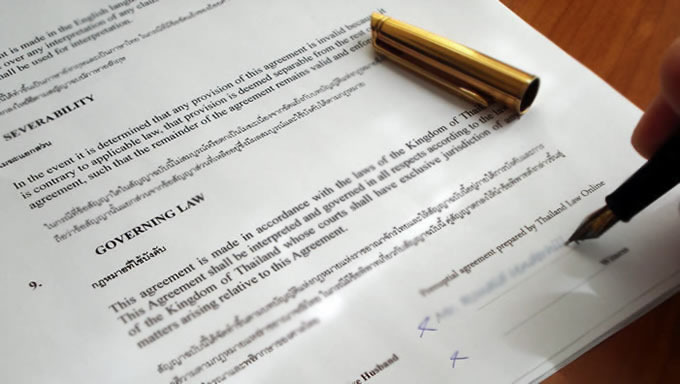 With a law firm specialized in handling marriages in Thailand, the process can be expedited. When is a Thai Will Considered Final and Executory and When is it Considered Null and Void?